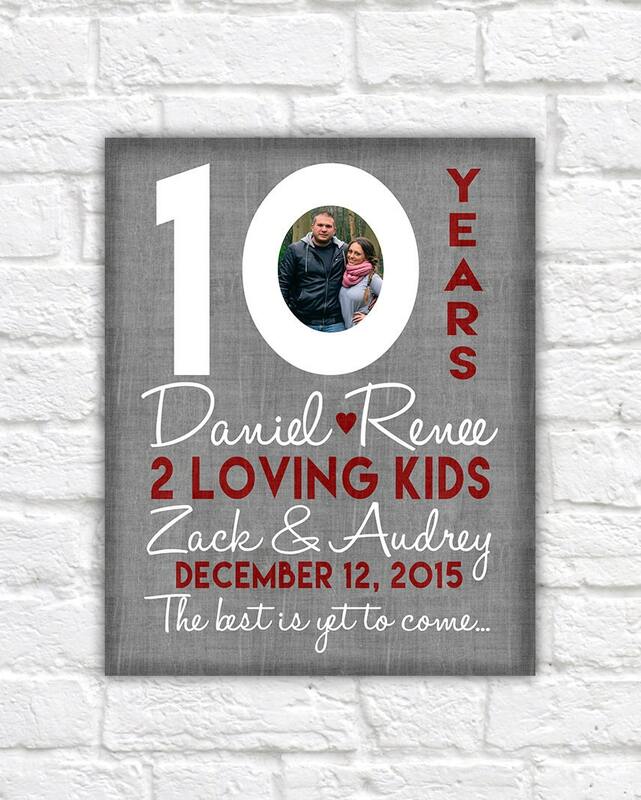 Custom 10 Year Anniversary Art with your photo included! 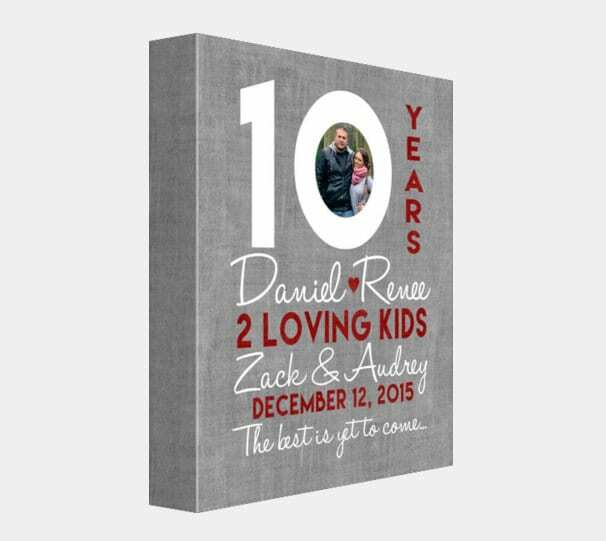 PHOTO PRINT (8x10, 11x14 or 16x20): Your Print on a semi-matte, archival Photography paper. (The most popular option) Easy to pop into any frame! Interested in having me frame it for you? Please see options further down in this listing. PRINT MOUNTED (8x10, 11x14 or 16x20): A Photo Print mounted on a 3/16" thick, white foam board. This option is ideal for those wanting a blank map to stick pins into. FINE ART PAPER (8x10, 11x14 or 16x20): Your print on Premium Giclee paper. This is a thick, luxurious paper with a matte finish and watercolor like paper texture. A great option for those wanting something a step above Photo prints. CANVAS SHEET (8x10, 11x14 or 16x20): Your image printed on a Matte Canvas Sheet (unwrapped canvas) with a white border surrounding it. The canvas sheet has a matte protective coat to preserve the image and matte appearance. WRAPPED CANVAS (8x10, 11x14 or 16x20): A 1.5" thick canvas, wrapped around stretcher bars and ready to hang! Thanks for visiting Wandering Fables! Continue shopping: www.etsy.com/shop/wanderingfables for more Anniversary Gifts and for all other special individuals in your life! Payment is required before the creation of your item due to the nature of the customization process. Actual shipping time can take anywhere from a few days to a few weeks, depending on where it is shipping to. Usually about 1 week or less on most US orders. I will use your Etsy address by default. 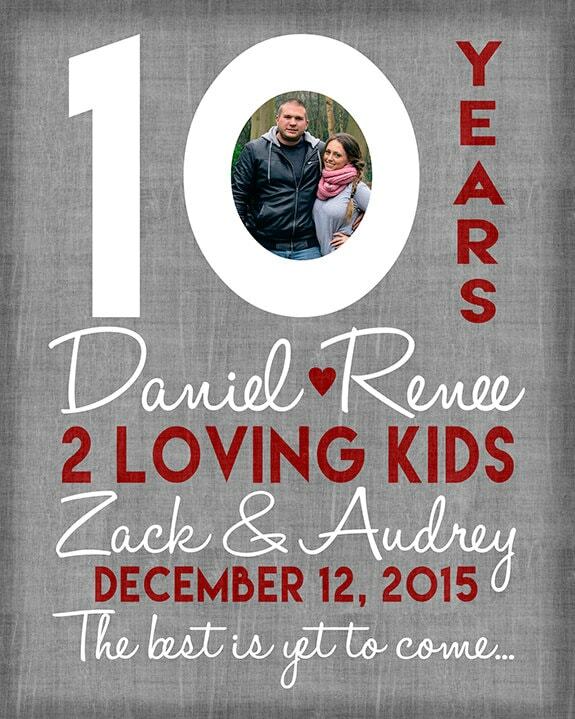 If this is out of date or if it needs to go to a different address, please let me know before your print is shipped. If the print goes to an out of date or incorrect address, buyer will be responsible for obtaining package or having a new one sent. Please be sure your address is correct and contact me ASAP if it is not. If you need something in a hurry, please be sure to let me know as soon as you purchase via Etsy messaging. Your order notes will not be viewed until the day of your proof creation. DIGITAL customers: The Digital will be sent to you as a JPG via Etsy message. You can save the image from the attachment that will be provided in that Etsy message, which will be sent to your Etsy inbox within 1 week. Please note that any changes needed on your Digital must be requested within 30 days. Any requests after 30 days will result in an additional charge. If you would like your Digital emailed to you, please let me know, otherwise, it will be sent to your Etsy inbox only. Due to the nature of the Custom items, refunds cannot be given. As soon as your proof is made, there will be no refunds, as much of the cost of your item is the custom design work in creating your special print. All cancellations must be requested prior to your proof being made. Unfortunately, any cancellation requests after the proof is made will not grant you a refund. Please note that every computer monitor is calibrated differently. 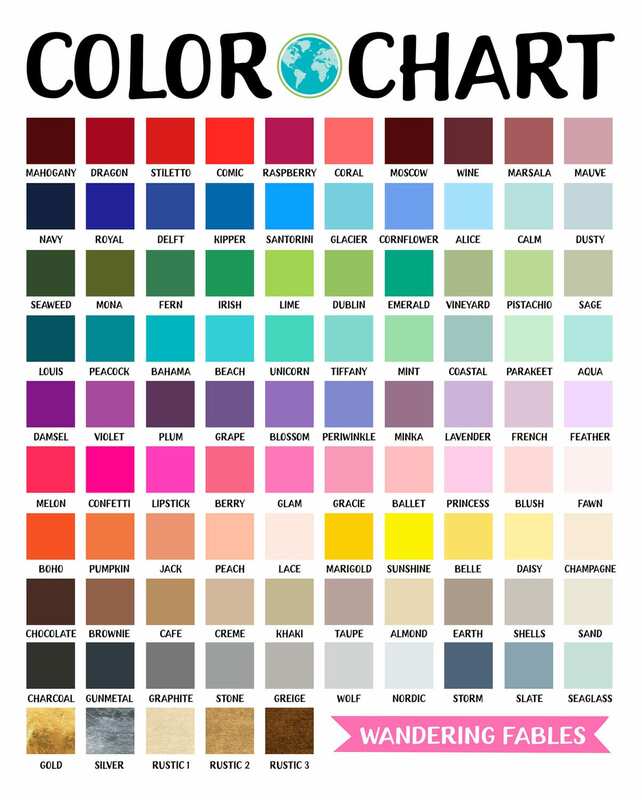 The colors you see on your screen may be slightly different in print form. Please contact me with any questions you may have before you make a purchase. Should there be damage or loss to your shipment, I will issue a replacement piece. Any damage must be endorsed by pictures of the package and item(s) included. Please add the item you want to your shopping cart. In the "Notes to Seller" box at checkout, you will type in your customization notes. Please be as thorough as possible! In each listing is a description of all the details I need. Please note that your customization notes will not be read until I create your proof. So any questions you need answered, please be sure to contact me directly via an Etsy message. Yes, but only if you have purchased the item! Due to the customization process, proofs are only sent after purchased, not before. I will send your proof to your Etsy inbox after your purchase. Please be sure to keep an eye out for that message! Proofs are sent within 1 week to your Etsy inbox. At checkout, there is a "Notes to Seller" box. In that box, you will provide the details for your print. If you forget to do this at checkout, just send me an Etsy message with your information. After I create your proof, I will send you an Etsy message with your proof. At that time, you will review your proof and make sure all information is correct, if you need any changes, let me know at that time. Your purchase will ship after I receive your approval and the printing process is complete. Shipping within the US in most cases is via USPS First Class mail. Shipping can take anywhere from 3-14 days within the US, depending on USPS. For international orders, shipping can take anywhere from 7-24 days, depending on the location and customs. Please note that once the package leaves, I have no control over the delivery time. If you need your item rushed, please send me an Etsy message to discuss options. Cancellation's will only be granted if the proof has not yet been created. Please note that I create all prints myself and each print takes time to create. Refunds cannot be given after the Proof is sent. Please be sure to send any cancellation requests prior to your Proof creation. Please review your proof prior to approving it! This includes everything, from spelling down to any calculations. As I do create each proof myself, mistakes can happen from time-to-time. It's up to the customer to review their item for complete accuracy prior to approving. Unless an upgrade in size has been purchased, all prints are a standard 8"x10". ::::PHOTO PRINT:::: (8x10, 11x14 or 16x20): Your Print on a semi-matte, archival Photography paper. (The most popular option) Easy to pop into any frame! Interested in having me frame it for you? Please see options further down in this listing. ::::PRINT MOUNTED:::: (8x10, 11x14 or 16x20): A Photo Print mounted on a 3/16" thick, white foam board. This option is ideal for those wanting a blank map to stick pins into. ::::FINE ART PAPER:::: (8x10, 11x14 or 16x20): Your print on Premium Giclee paper. This is a thick, luxurious paper with a matte finish and watercolor like paper texture. A great option for those wanting something a step above Photo prints. ::::CANVAS SHEET:::: (8x10, 11x14 or 16x20): Your image printed on a Matte Canvas Sheet (unwrapped canvas) with a white border surrounding it. The canvas sheet has a matte protective coat to preserve the image and matte appearance. This is not your usual shiny canvas, it looks beautiful in frames and bright rooms. ::::WRAPPED CANVAS:::: (8x10, 11x14 or 16x20): A 1.5" thick canvas, wrapped around stretcher bars and ready to hang! Please send ALL communication via Etsy's messaging tool (Your Etsy Inbox). Please note that any emails sent may not reach me. A Digital can be rushed at an additional charge. Please contact me if you need your Digital rushed and we can work something out! Your Digital will be sent to you via your Etsy inbox as a JPG attachment. If you would like it emailed as well, please provide me with your email address in the notes box at checkout. Otherwise, your Digital will only be sent to your Etsy inbox. When you receive the Etsy message, open the thumbnail attachment (so that it enlarges full-size) You can then right-click and save it to your desktop. It is a JPG file. If you would like a PDF as well, please let me know in the notes box at checkout. Please add the item you want to your shopping cart. In the "Notes to Seller" box at checkout, you will type in your customization notes. You can see the exact information required by clicking on the "Item Details" tab of the listing. Will I receive a proof? Yes, but only if you have purchased the item! Due to the customization process, proofs are only sent after purchased, not before. I will send a proof to your Etsy inbox within 3-5 business days after your purchase. What are the different product types? Please check out image 3 of the listing. There is a chart which shows each product type. Also be sure to click the "Item Details" tab of the listing to view more detailed information. Why do I have to pay shipping on the "Digital" option? If you are choosing the "Digital (NO PRINT)" option, please use the following coupon code to deduct your shipping charge: DIGITAL. The Digital is the option meant for you to print on your own, so there will not be a shipping charge. If you forget to enter this code, we will refund your shipping charge at the time your Digital is sent. Please ONLY use this coupon code on the "Digital (NO PRINT)" option. How far in advance should I place my order if I need it by a specific date? Ideally, we recommend placing your order 3-4 weeks in advance if you have a specific date the item is needed by.